For alternative shipping options, please contact us directly to place an order. 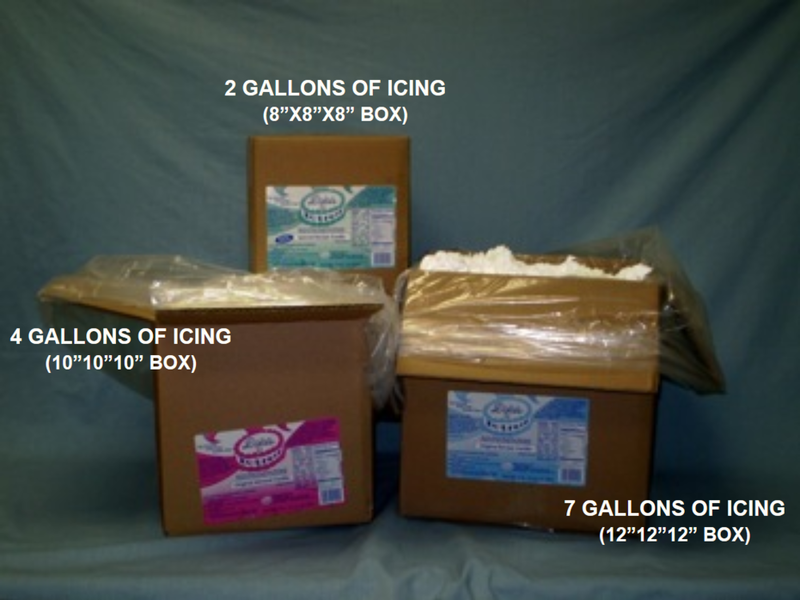 Icing is packed into food-safe plastic bags (rather than our standard pails), then into heavy duty, double-wall, corrugated box containers. Normally, a single, 1 gallon pail of icing is shipped inside an 8”x8”x8” box container. With this option, that same box holds 2 gallons of icing! No icing will be lost or wasted using this option. After most of the icing has been used, the bag can be placed in the freezer (10 - 15 minutes), and the remaining (frozen) icing can be easily shaken out of the bag into another container. In just a few minutes, the icing will warm up and return to its original smooth and creamy consistency. Ships anywhere in the United States in 2-3 days, and includes free Saturday delivery. A perfect option for late orders, or prohibitive UPS transit times (e.g. rural locations, Hawaii, U.S. Territories), or military APO shipments. Utilizes “Bag-in-a-Box" packaging, to conform to standardized USPS supplied boxes.